On Friday, May 29th, 2015 most of Backblaze took the day off to go sailing in San Francisco bay. 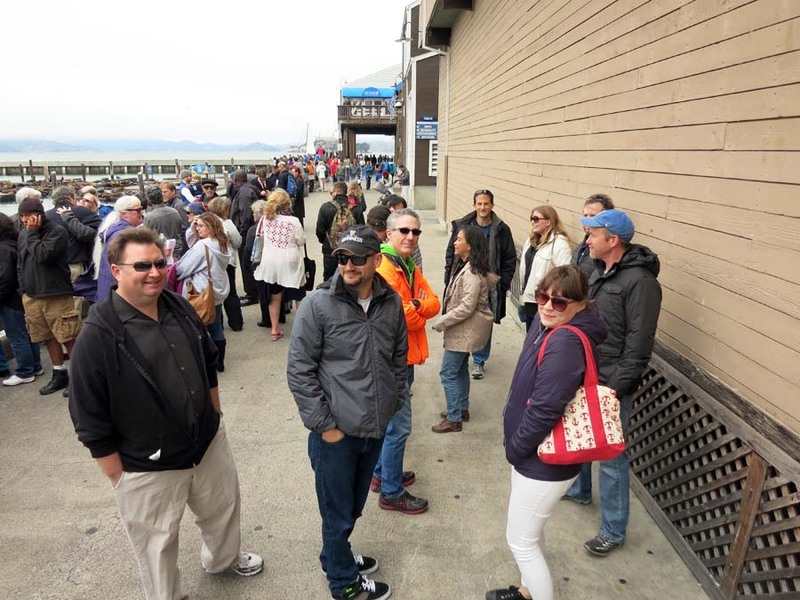 Below are a few pictures, click on any picture for the highest quality "original". 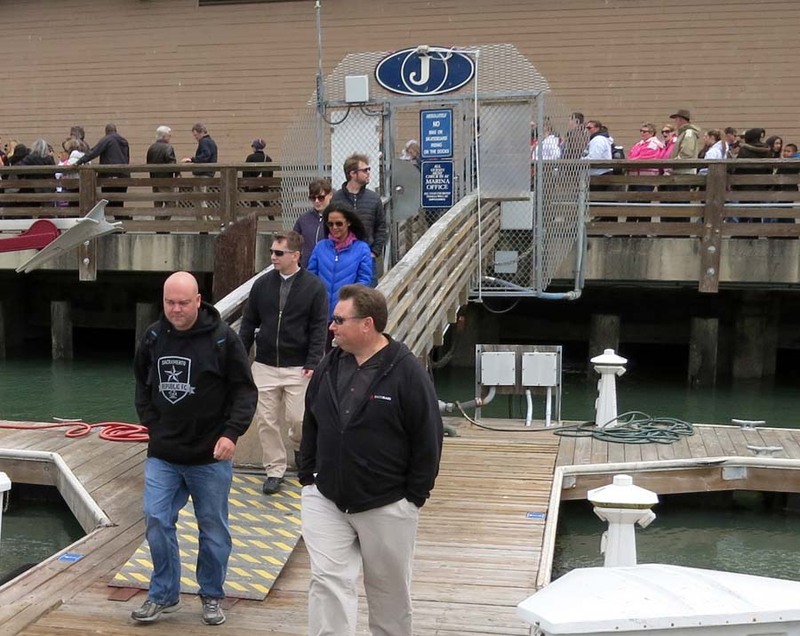 Below is where we met at Dock J on Pier 39 in San Francisco. We enter through the "Dock J Entrance" and walk to the catamaran. Below from front to back is: Sean Harris, Aaron McCormack, Casey Jones, Elsie, Kristen Nelson, Ariel Ellis. Casey Jones, Kristen, Elsie looking at the sea lions on Pier 39. Casey Jones on a boat. 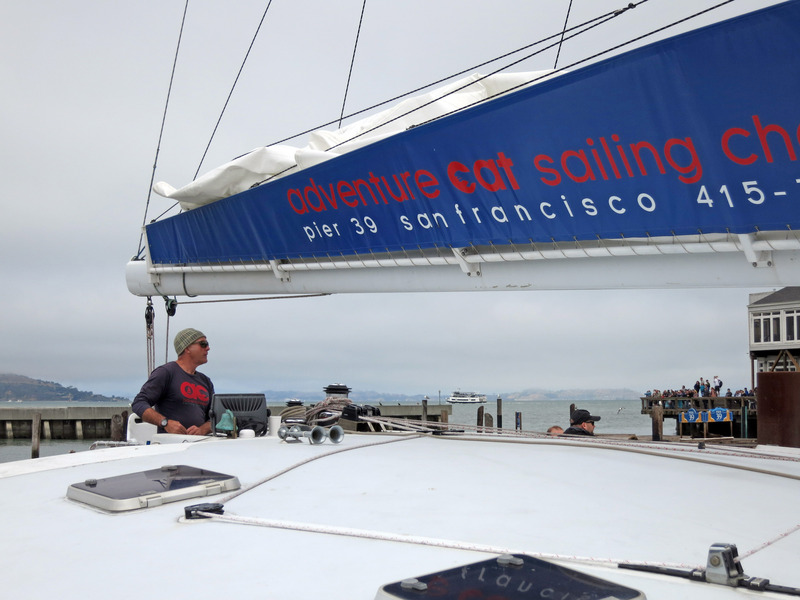 We are on "Adventure Cat 2" with Adventure Cat Sailing Charters. 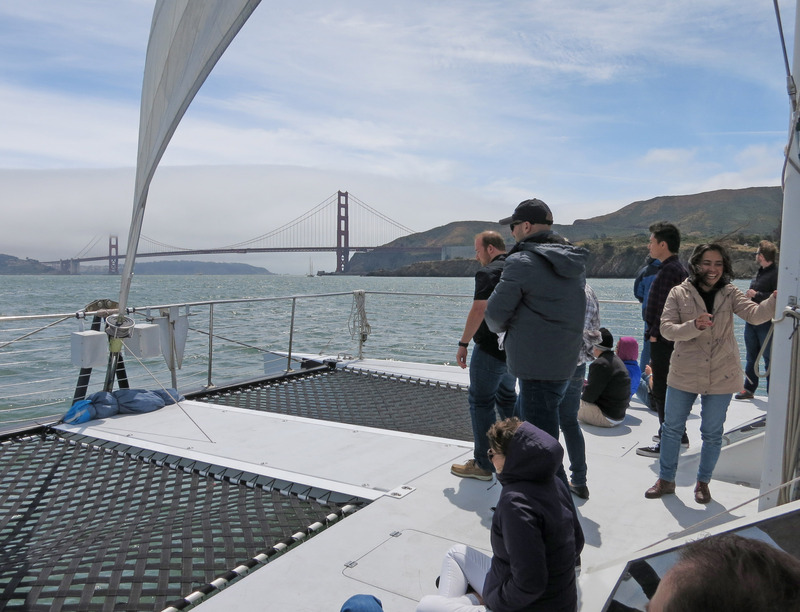 A panorama in the main cabin with everybody. 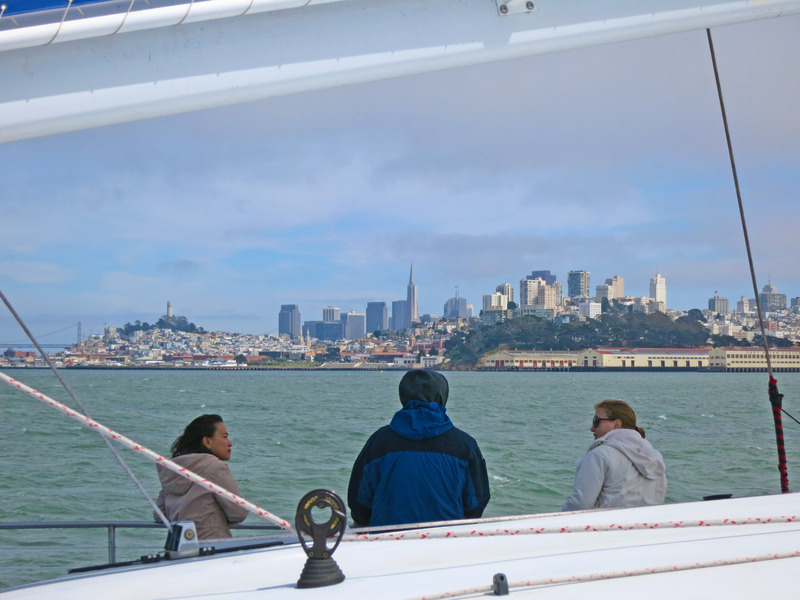 Captain Michael is giving a few instructions to all of us, like where the heavy jackets are. 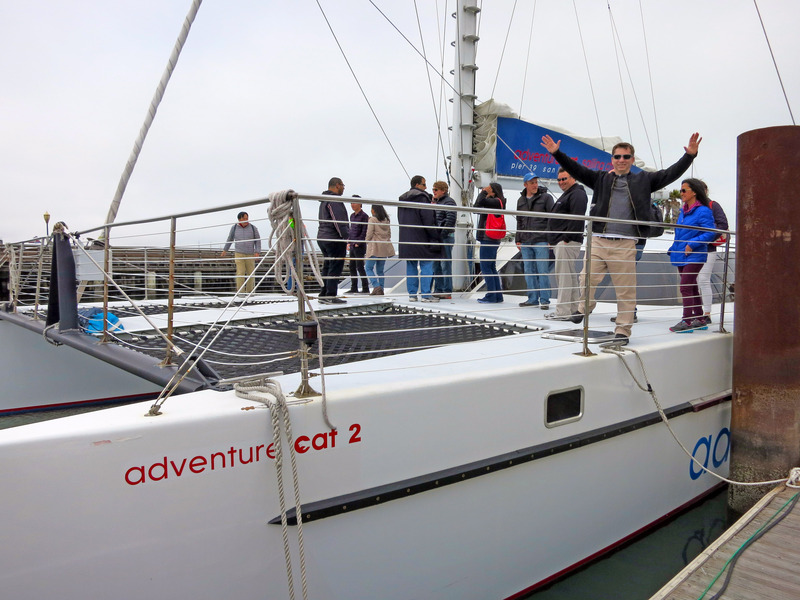 And away we go - here is Captain Michael pushing back from the dock. 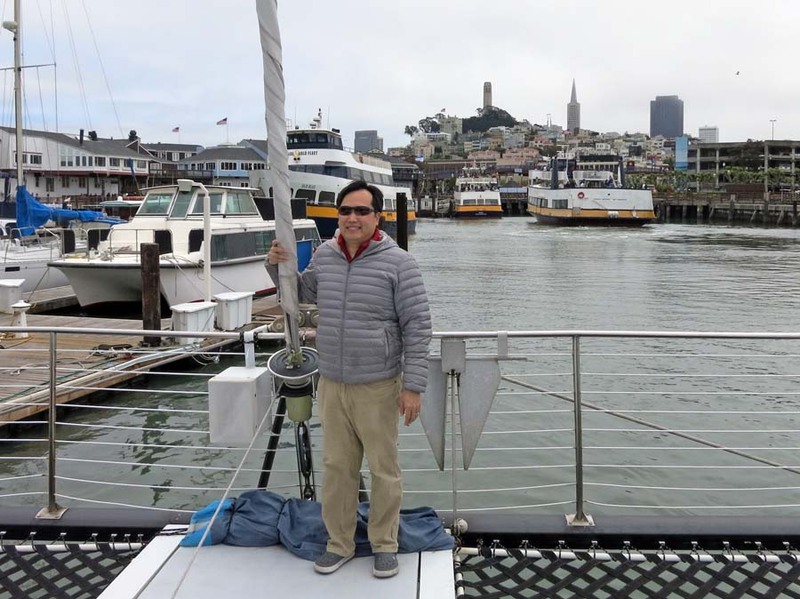 Billy Ng as we depart the harbor. 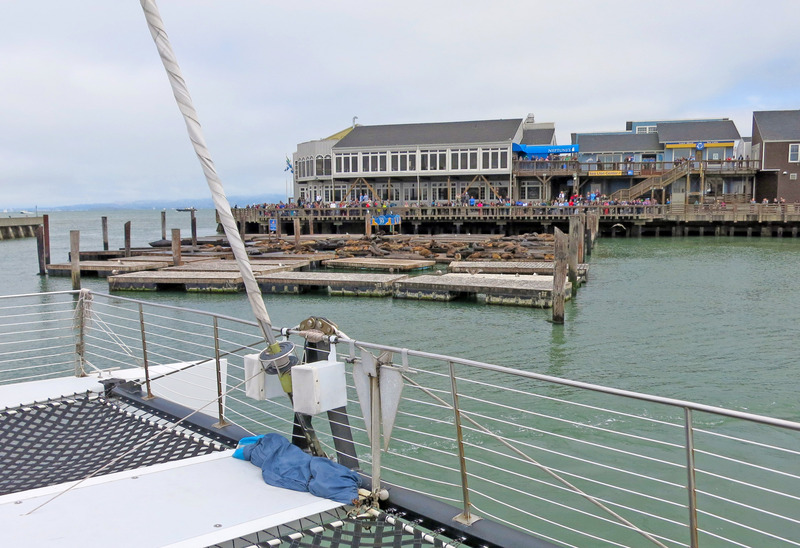 A view of the sea lions on Pier 39 in San Francisco. Below is a 50 second movie of departing on the boat trip (and returning) and seeing the famous sea lions on Pier 39 in San Francisco. Click here for the very highest quality original movie. Just outside the harbor, everybody looks up at the sail being raised. 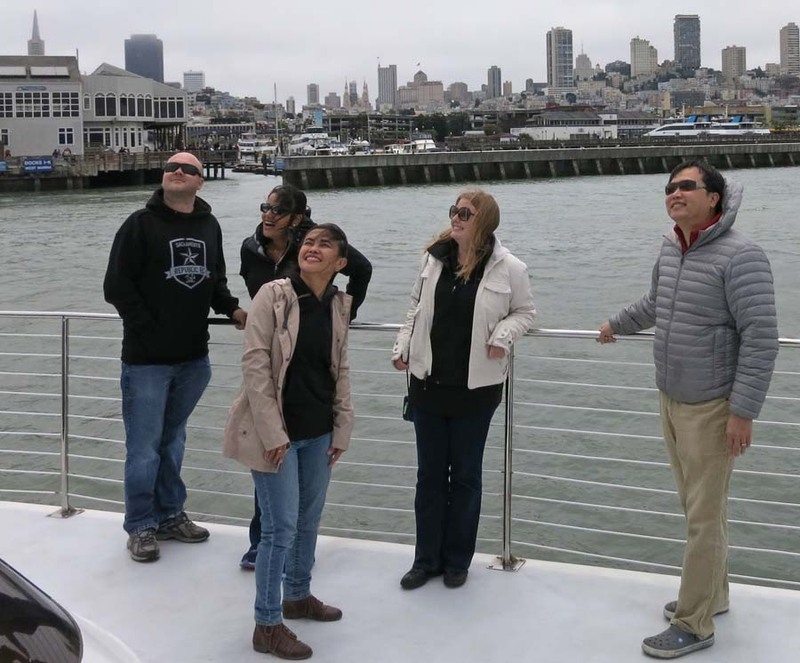 From left to right: Aaron McCormack, Sona Patel, Cecilia Luu, Candance Bain, and Billy Ng. 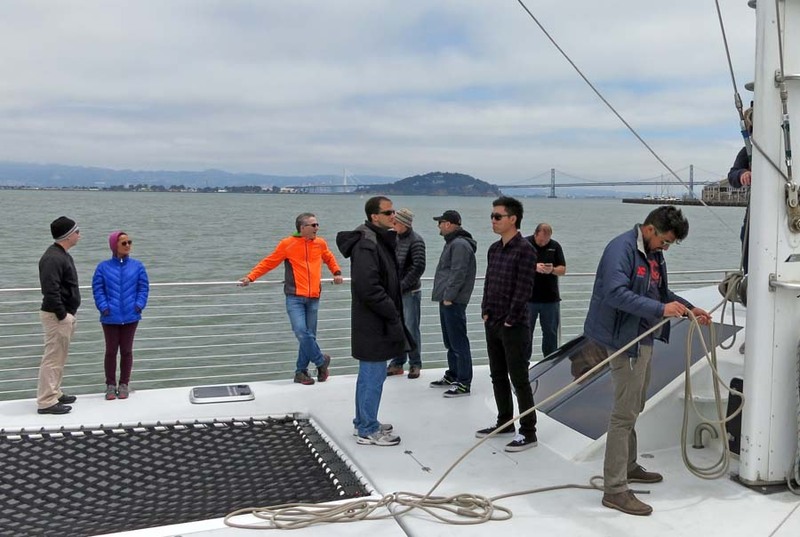 As we get under way, from left to right that is Casey Jones, Elsie, Tim Nufire, Adam Feder, Dave Stallard (stocking hat partially blocked), Adam Nelson, Eric Tam, Yev Pusin (looking down at his phone), and the guy playing with the ropes (lines) is crew member Keith. 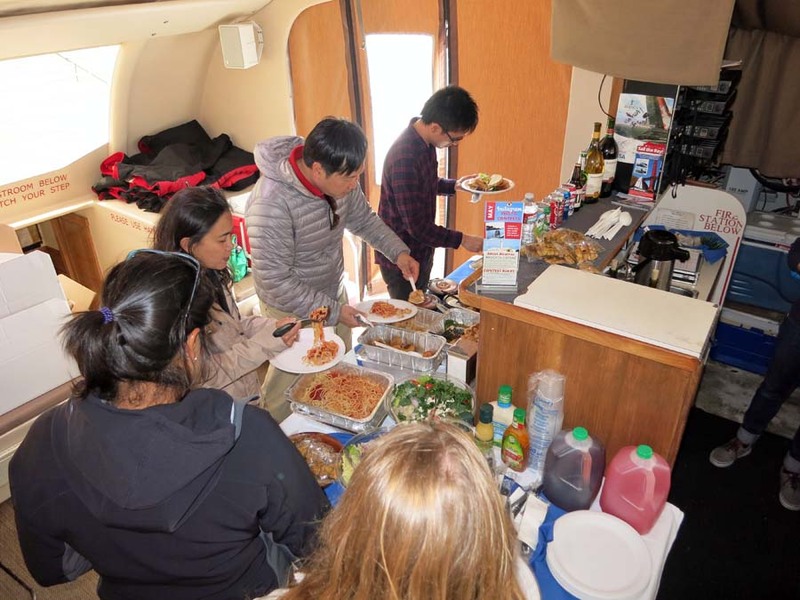 We brought along food and the boat provides drinks. 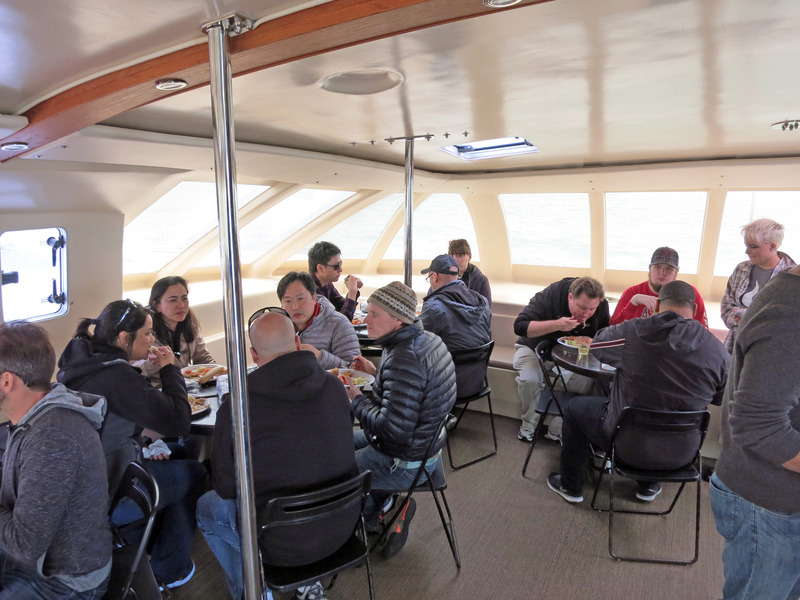 A bunch of people having lunch on a boat. 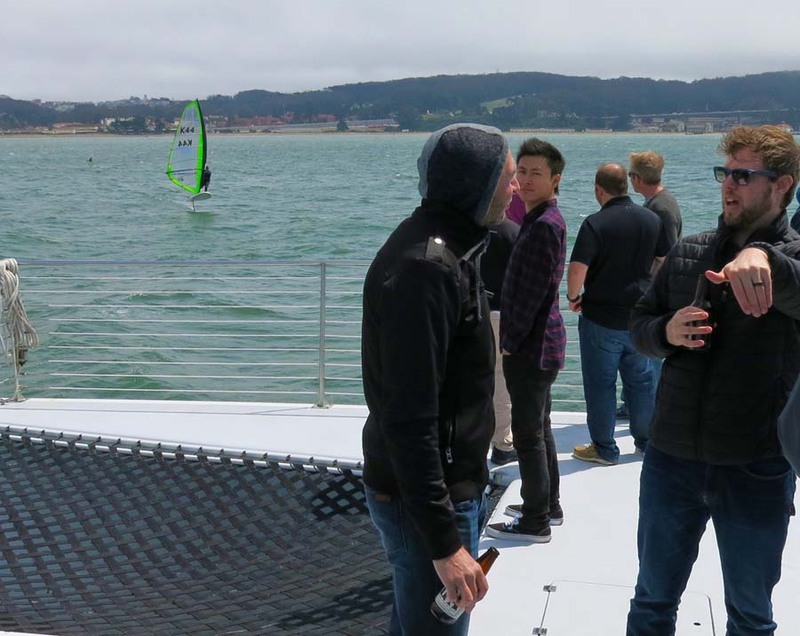 On the far right is Backblaze CEO Gleb Budman. 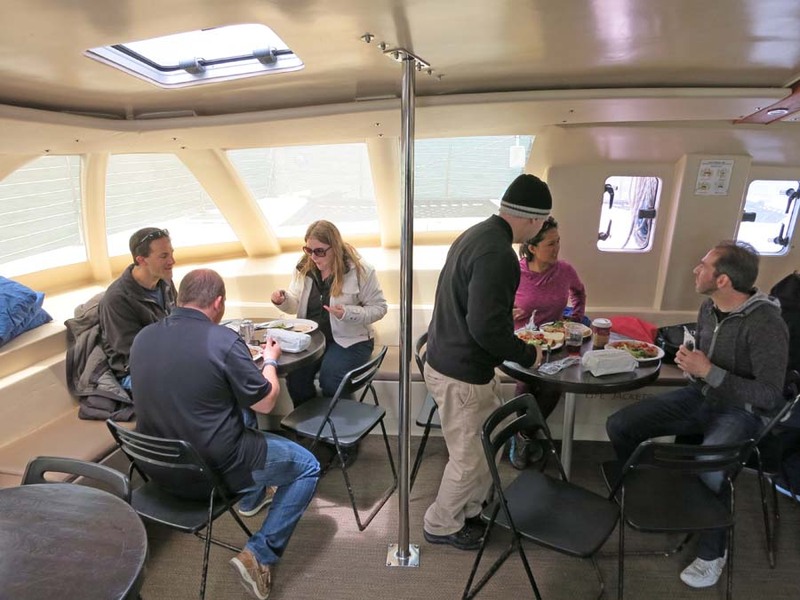 More people eating lunch on a boat. 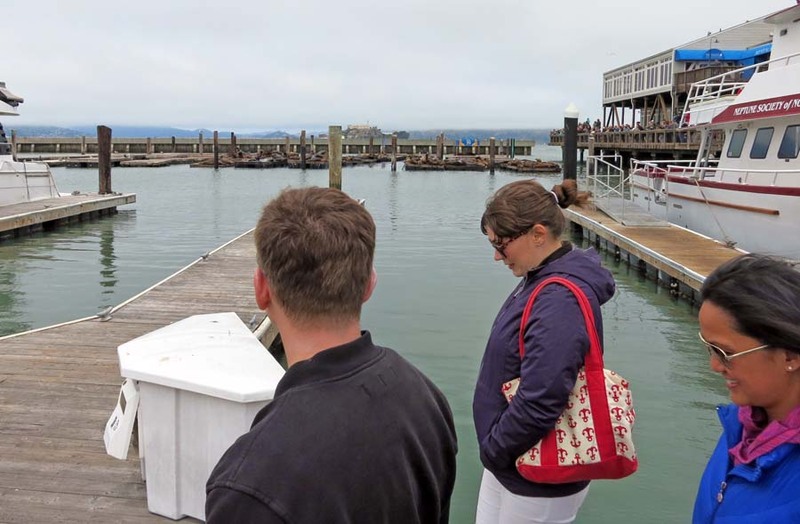 On the very far right in red shirt and hat is Zack Miller, and to his left (far far far right in the picture below) is Emily Miller. 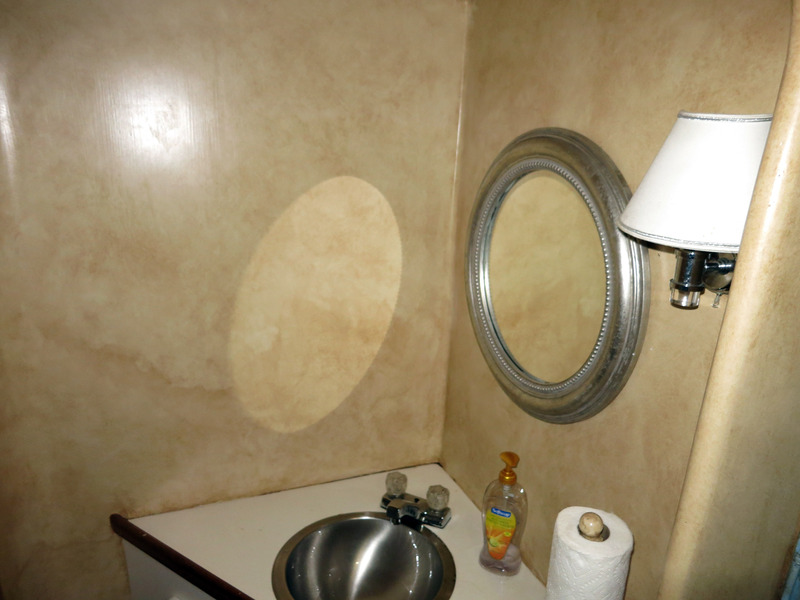 The boat has several bathrooms, I thought they were very comfortable and nice looking. 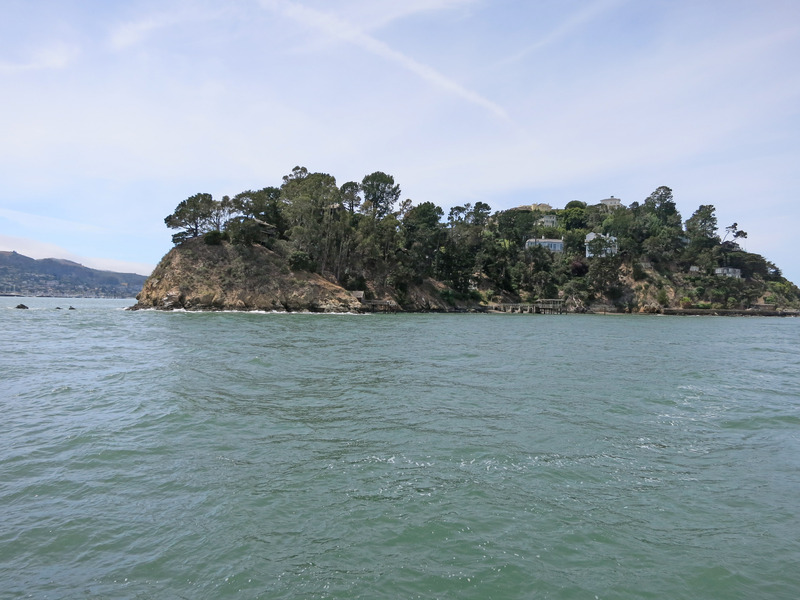 I think this is the tip of Tiburon? 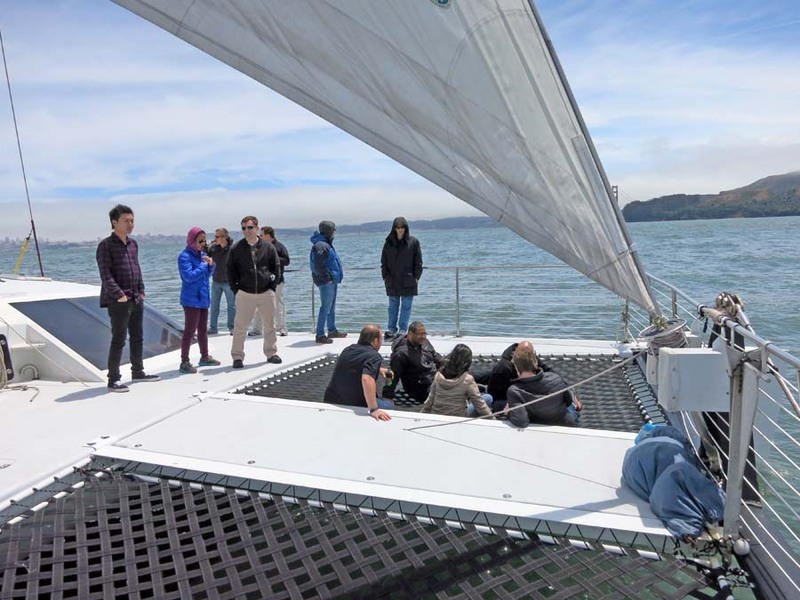 Backblaze family hanging out on the webbing on the sailboat. 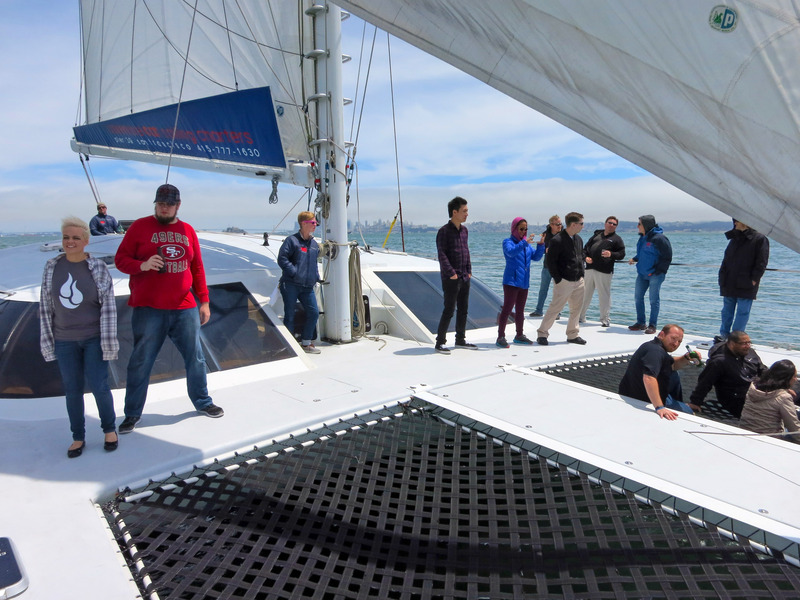 From left to right: Emily Miller, Zack Miller (in red), Julie (boat crew member), Eric Tam, Elsie, Sean Harris, Tim Nufire, Yev Pusin (sitting down in the webbing looking towards the camera), Ken Manjang (sitting on webbing next to yev) and Cecilia Luu facing away sitting on the webbing. 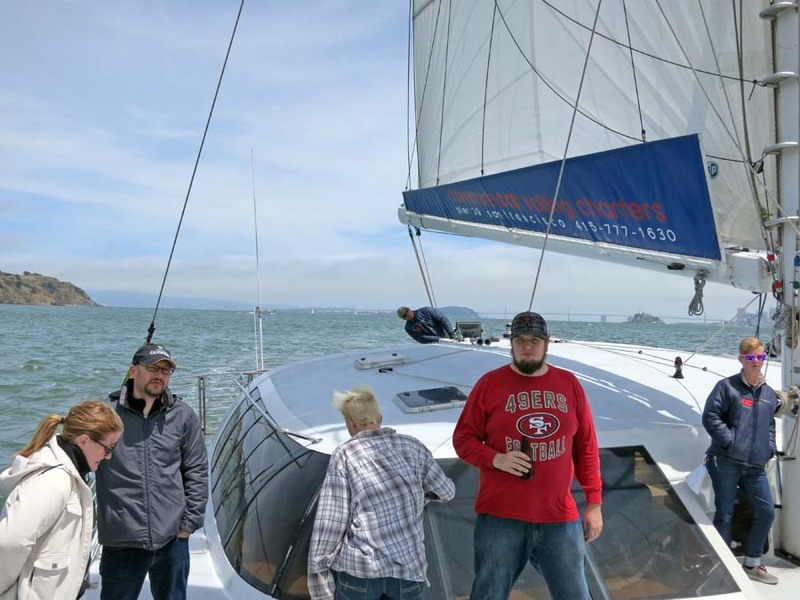 From left to right: Candace Bain, Adam Nelson, Emily Miller, Captain Michael (leaning over in the cockpit), Zack Miller, and leaning up against the mast is Julie (crew member). 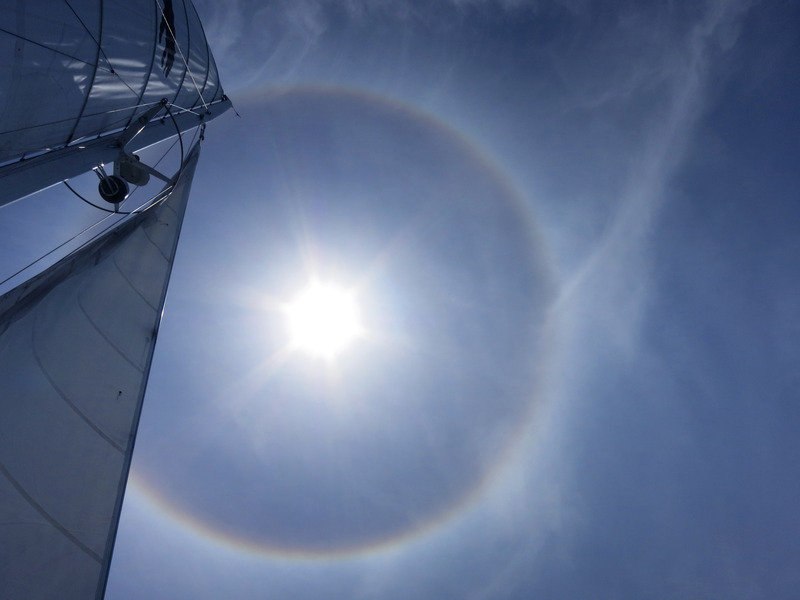 In the middle of the afternoon, we look up and see this 360 degree rainbow around the sun, which we think is a Halo or possibly a "Sun Dog". I had never seen anything like this. Ariel pointed out it is darker in the middle of the ring, which doesn't make any sense because there should be more light in there. 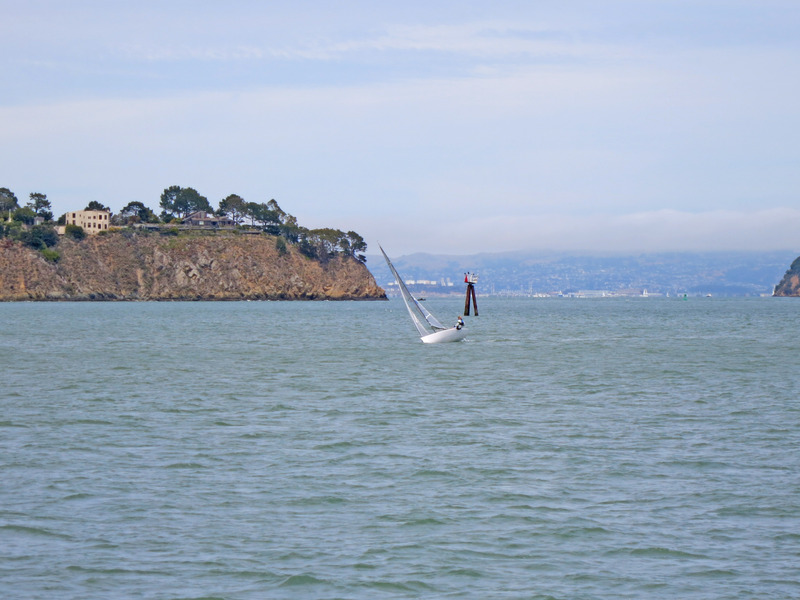 I took the following picture of a random single-handing sailor in the San Francisco bay heeled over. 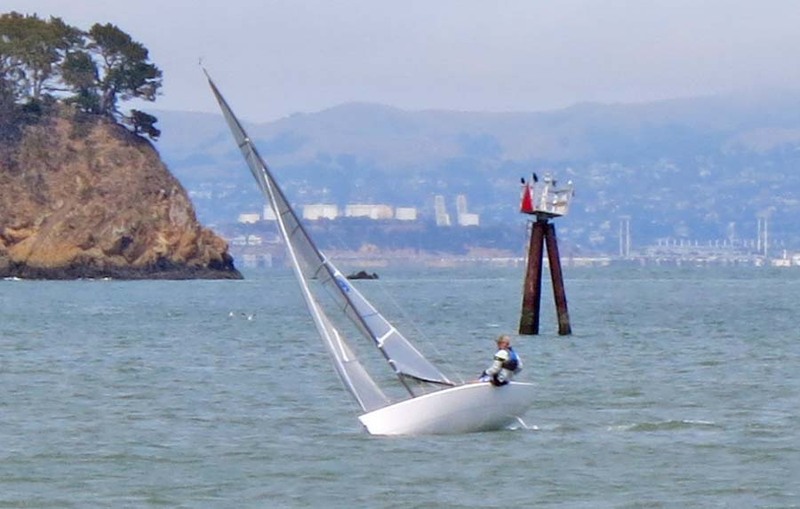 It looks like this guy is pretty good at what he is doing, which is Trapezing (leaning out over the edge to keep the boat upright). A picture of the Golden Gate Bridge hidden half in the fog. 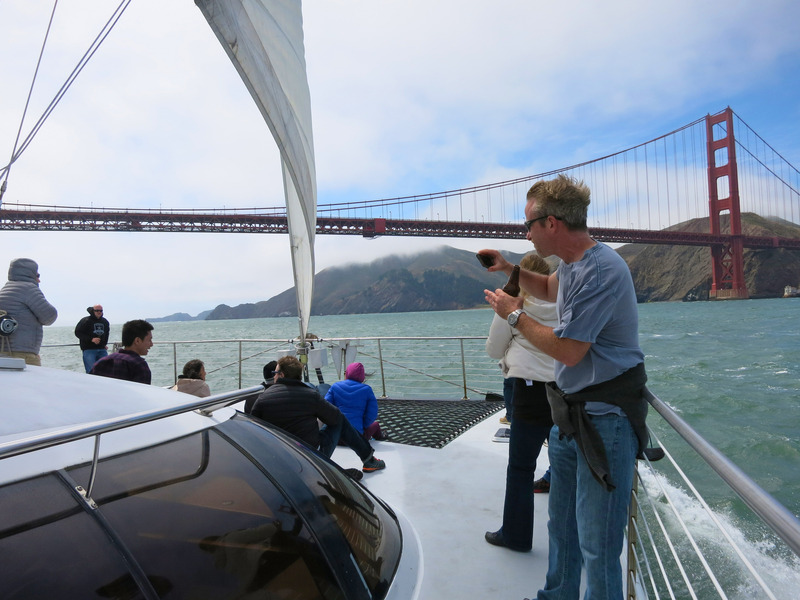 We sail up tacking towards the bridge and then turn downwind. 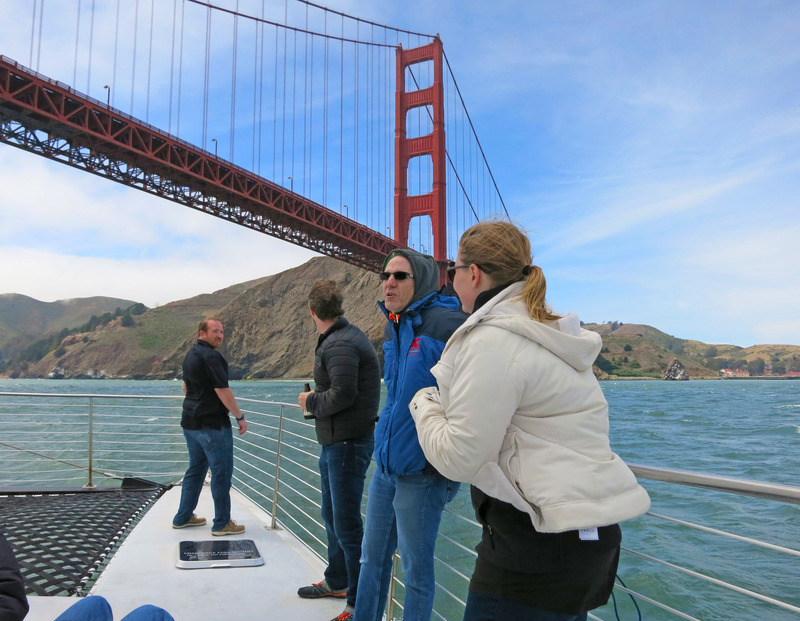 Here we are approaching the Golden Gate Bridge. 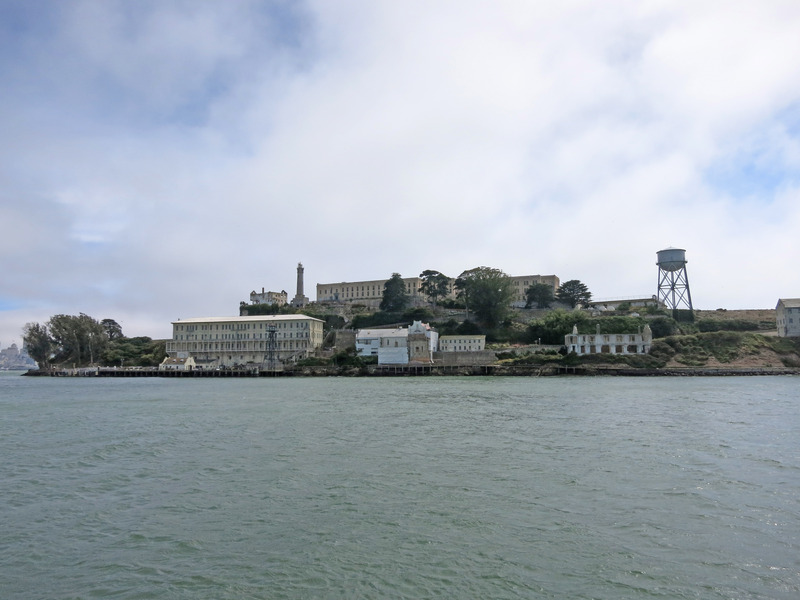 Another picture as we get closer. 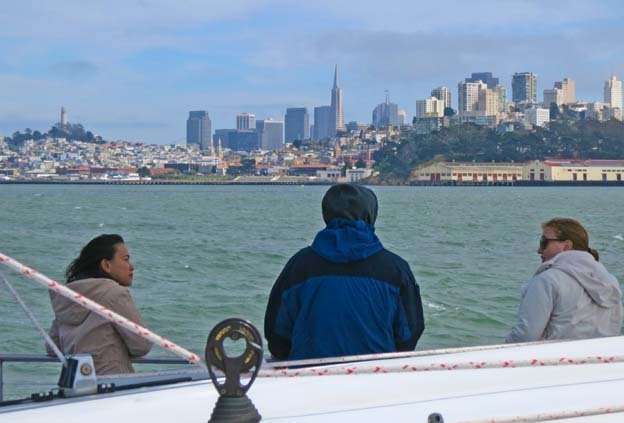 Behind the people in the foreground, the wind surfer coming towards us is HYDROPLANING! 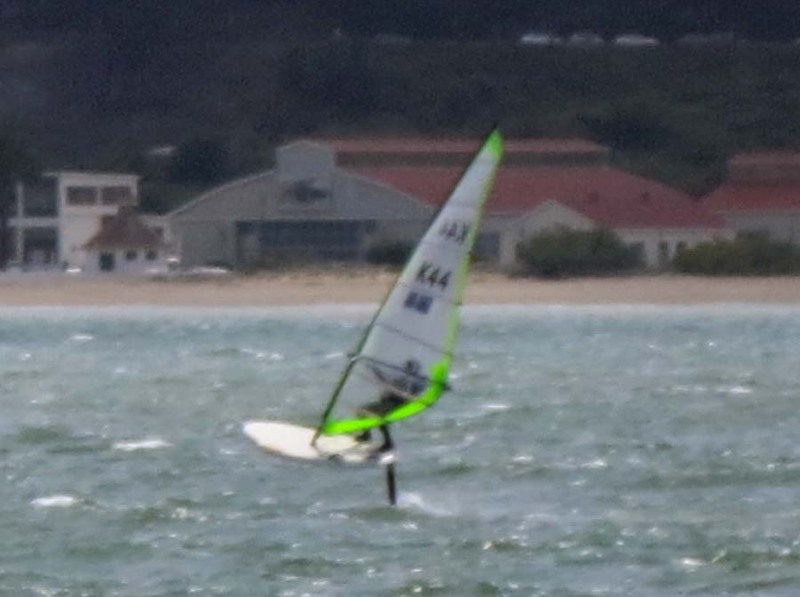 This is a grainy zoomed in picture showing the wind surfer hydroplaning. A picture of the San Francisco skyline from a boat in the San Franisco Bay. 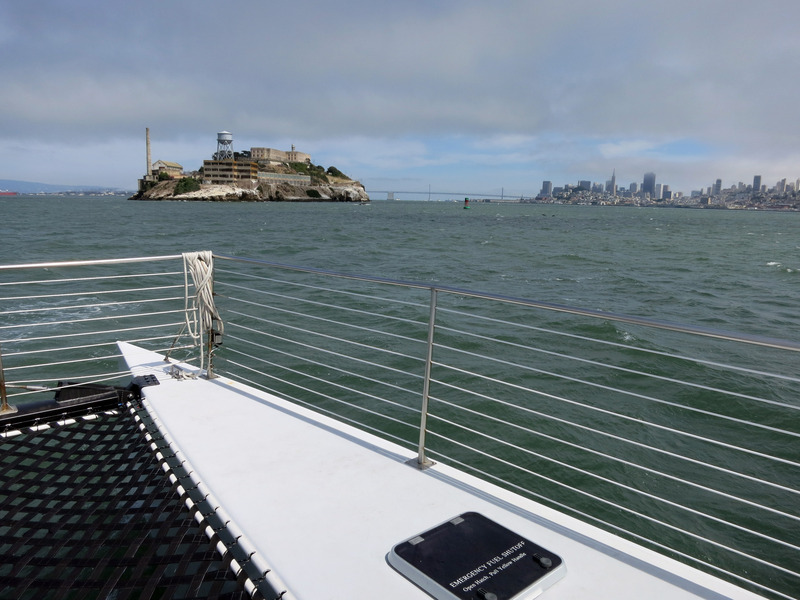 Alcatraz Island as we pass by. 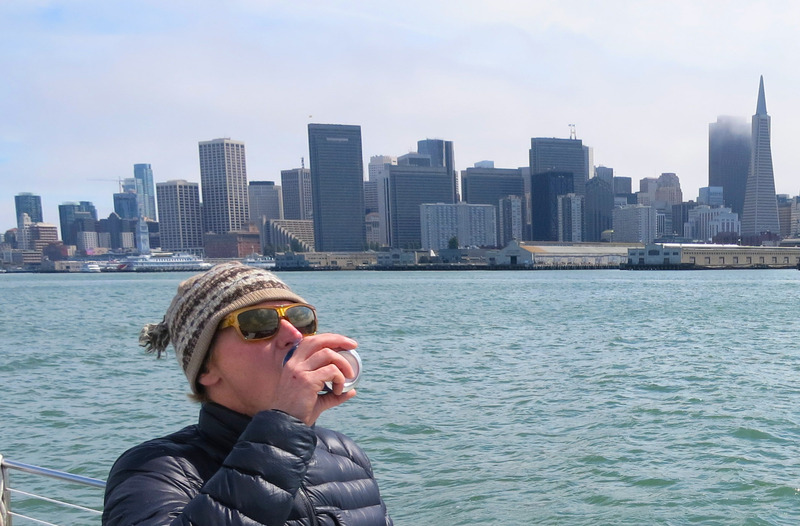 Dave Stallard photobombs my picture of the beautiful San Francisco skyline. 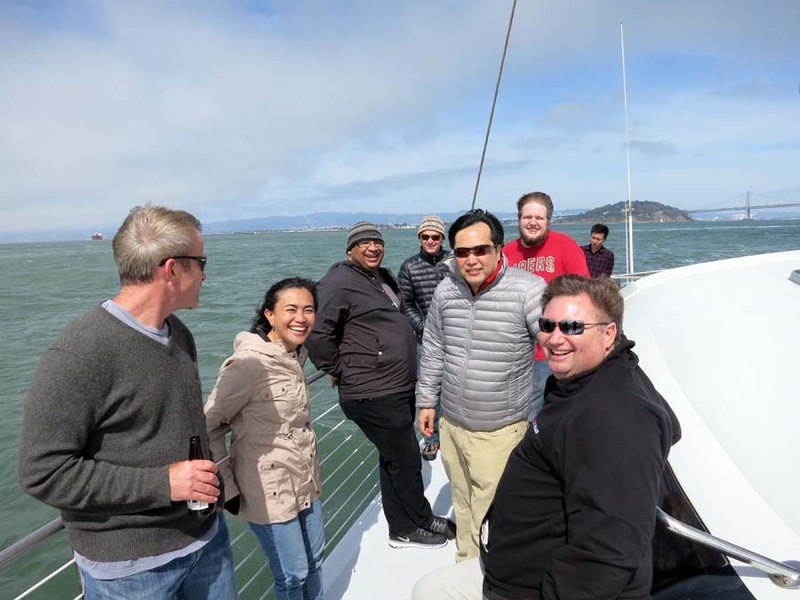 From left to right: James Fleishman, Cecilia Luu, Ken Manjang, Dave Stallard, Billy Ng (silver jacket), Zack Miller (red shirt), Sean Harris (in front) and in the far far back is Eric Tam.